Conditions Slowly Improving, Fishing Remains Pretty Good…. Wed. Mar. 29, 2017 …..Our fishing has been superb regardless of the conditions it seems, as we have done extremely well wherever we have fished. Its been a good March, and we are beginning to get some much needed rain over the High Country where things have been very dry since the end of January. So no complaints here on the rain. It really doesn’t matter to me what we get in terms of conditions, we take what we get. There are no perfect worlds or situations, and waiting til things are perfect (weather included) to go fishing is a mistake. Simply put, continuing to fish and solve problems across a wide range of conditions makes anyone a better angler…..and guide. On the fishing reports page of my site for our 3-22 and 3-23 Trout Bum trip I did not get to post but a few photos because the camera /phone took a swim while doing some net work….. we were in the very rugged section of the Watauga River Gorge and I fumbled the phone while trying to get a shot. 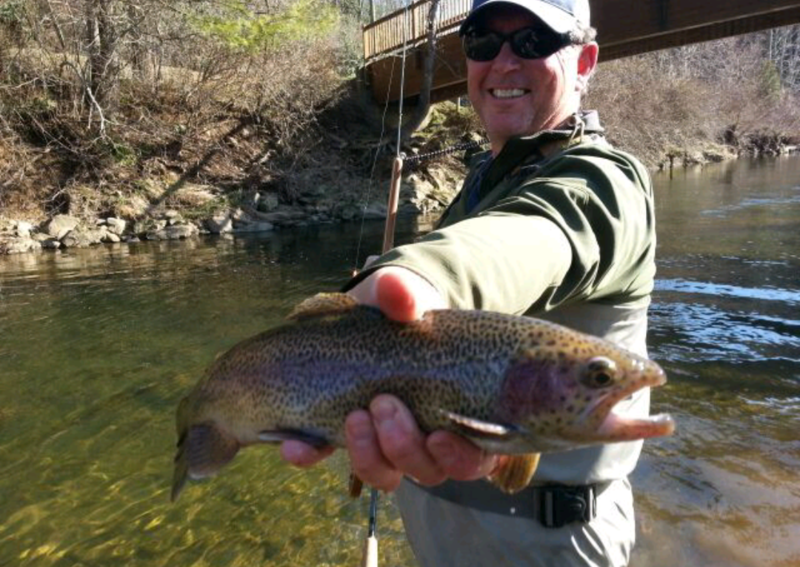 But thanks to Samsung technology and a new snap in battery the phone not only still works like a charm but I was able to recover the pics…..including Lloyd Allen who landed this fantastic rainbow from the Watauga Gorge…….it was only Lloyd’s second time doing this and first all day trip. He landed 14 other fish as well. Had a Friday cancellation from a client so I spent the better part of Friday and Saturday doing some work on my mom’s property in prep for settling her estate. Many of you knew her, she passed and went to be with the Lord in October and for the next several months/year we’ll be taking every available extra day to take care of all that stuff. On Monday 3-27-17 I did a full day small stream guided Trip, with Ken Okorn and his group, Mechanicsburg, PA, and were originally going to fish the TN Tailwaters, we opted based upon several factors to hit a small stream on the NC side, and it would prove to be a good move, as Ken and his friends Chet, John, Ed, Bob, and Tom all together put between 150 and 200 fish in the net. The nymph fishing was crazy good. As good as it gets. The fishing was great, but these guys can really fish, and Ken is a guide himself, so that they did that well didn’t come as a surprise to me. These guys are lethal……they can fish. Enjoyed it a lot, have gotten to know Ken pretty well….and he’s as good as they come, both fishing and otherwise. He’s one of those guys it pays to not talk and just listen and you will learn a lot. We fished til about 6pm and had thunderstorms rumbling all around us, some of which brought some much needed rain later. We did very well though it was all nymphing, even with the multitude of caddis around. Only a handful of risers, and when they did rise it was once and that was it. But that is common with the caddis hatches in our area, the fish don’t always feed on the surface because they emerge so quickly. Usually its emergers or during egg laying activity when we get our best chances. Skittering, twitching, swinging soft hackles, that all works occasionally but nothing “always’ works. You have to experiment. I had scheduled a 3-28-2017 trip with one of my regular clients from home Dr Pat Burney, and we met bright and early, and headed off. I must admit that when I was awakened to the sound of heavy rain at 425am (my usual time of getting up) I immediately got up and checked the radar. This is a shot of the upper Mitchell, which I sometimes hit in the spring before it gets too warm, and it can be quite good. 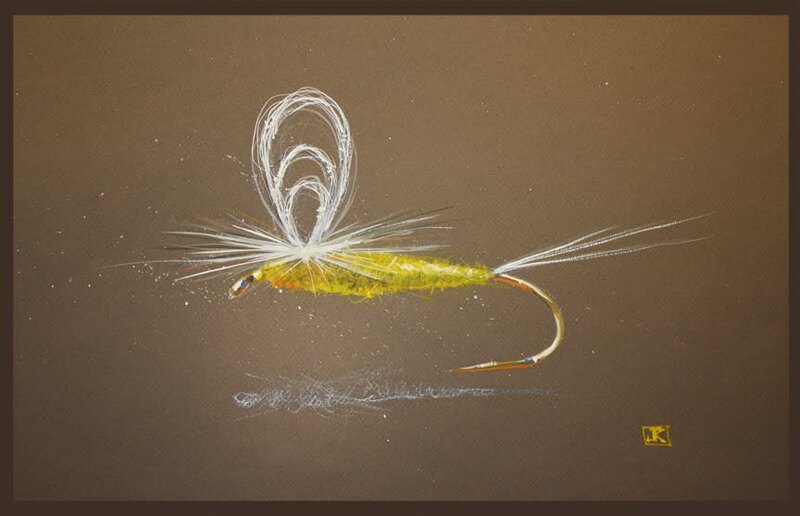 Those who know of the hatches know it to offer some of the best dry fly fishing of all our Foothills streams. The sulphur hatch, which comes off between April 15 and the first of May, can often be epic. Lots of rising fish. The Mitchell is loaded with bugs, one of our most fertile trout waters and top 5 in terms of water quality in the entire state of NC. Huge mass of thunderstorms had redeveloped and marched over the entire area of the NW mtns, foothills, and Piedmont. I suggest to Pat we try several different waters but it was too much, too much rain too quickly, and all 4 waters we checked out were high and muddy….blown out and unfishable. This is the old Kapps Mill Dam, and been sometime since this much water has flowed over it. The photos are on the Mitchell but it rained over a large area and we checked 4 different waters. Water colors ranged from Starbucks pumpkin spice latte to caramel macchiato….pick your flavor. But not fishable so we called it a day, reeled everything in, and returned to the fort. Have a private water trip with a client here in Summerfield, NC, Rob Rau and Rob and his friend Al with be joining me for the day hopefully spanking some large rainbows and browns. On Friday I have a trip scheduled with one of my regular clients from Columbus, OH, Dr Jeff Hutchison, and Saturday will round out the week guiding a New River musky trip provided Friday’s rain doesn’t pose a problem. You never know in the spring, you can have weather that is nothing that turns in to something major overnight and vice versa. Should have plenty of good action and reports though. Rain returns Friday, so it looks like it could be wet, things clear out midday Saturday and looks like warm and moist will continue for a while. That is good because we can use the rain. Fri. Mar. 24, 2017 …. A busy several days with daylight to dark travel and trips, just coming off a pretty good 2 1/2 day trip to the NW NC Mtns where the fishing has been good and continues to be so. Did a group trip over the past three days with a couple of regular clients Ted Linczak, Summerville, SC, and Peter Valenti, New York, NY, and Peter’s friend Lloyd Allen, who is from Pinehurst, NC. It was Lloyd’s beginning with fly fishing and he did quite well. On the first day one of the first fish he landed was a 21″ rainbow, best one of the day. Unfortunately I got my phone wet and am still trying to extract photos from it but so far no success. Actually, all the guys did well and it was a good trip with some better than expected weather and a lot of fish caught. I’d say total the two full days the guys put somewhere around or beyond 250 fish in the net. And a good mix of browns, brookies, and rainbows plus a sucker or two, which aren’t trash fish but also fun to catch. On Wednesday we fished two waters, and the first place we fished was on the Watauga Gorge area, and did very well. It was cold/chilly to start but not as much so as forecast, and breezy, but also not as windy as it could have been. Other than a few light showers Tues morning, the rain and storms that were forecast never happened. We got a dry front and we had great fishing. We landed total between 40 and 50 fish, and Lloyd had the large fish with a 21″ rainbow. We got a number of brookies and rainbows, and a good many real quality fish. The caddis that had been so prevalent were squelched by the weather change, at least that is what I guessed. We didn’t get any dry fly activity , it was all nymphing. 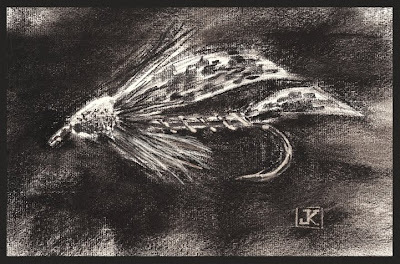 Sucker spawn patterns continue to work with a small nymph trailing or as a dropper. We fished til around 1:30pm and had lunch streamside, then headed over to fish the upper New. Did well there too, scoring another 50 or so including a 20 in brown landed by Ted, and many quality rainbows in the 14 to 16 inch range. Not many caddis here either, nothing like the blanket hatches of the past few weeks. But we still did well nymphing, and even finished up with Ted nailing a couple rainbows on dries. Great day, we quit around dusk and it was getting cold! Lows supposed to be in the 20sF…its spring right? On day two of our two day trip, we were up and out bright and early and fished 2 different waters, we fished the first one near McCann in Alleghany County and did very well, it was really cold, like mid 20sF, and heavy frost, and remained pretty chilly the whole time we were there. We tallied probably 50 fish there as well, catching the usual mix of rainbows and brookies but also a few wild browns to the mix, and one of the browns was in the 15″ range , and also had one of the guys land a large brook trout of 16 inches. We fished mostly double rigs, sucker spawns as they have worked everywhere, and an assortment of small nymph patterns…..a regular hares ear was working great. We stopped to have lunch about 1230pm and then make the short jaunt to Surry Co where we finished up the day. Landed probably another 50 fish there, a mix of rainbows and brookies. Great two days of fishing…..we need some rain in the worst kind of way! But still great fishing, and with the coming mild up, we should get some dry fly fishing because the water temps in a lot of our lower elevation streams is reaching that magic 50F mark. One thing is fairly certain, good dry fly fishing, or at least greatly improved dry fly fishing, will be ever present every day from this point on. Had a trip scheduled for today 3-24-2017 but had a last minute cancellation, so we are taking the time today and tomorrow 3-25-2017 to continue on a lot of work we are doing to my moms’ home as we are in the process of beginning to settle her estate. So looks like two days of that for Jeff, and hopefully we’ll get some rain as the weather folks are calling for it. We sure need it. Tues. Mar. 21, 2017 ….After a very mild weekend the week has started off the same way and both the weather and fishing have been great. I had a Monday 3-21-17 guided trip with one of my regular clients Dr Stephen Hardy, Lexington, NC, NC Mtns, and I met up with Stephen in the morning and we were off, had a great day for being outside, whether fishing or not…it was some great weather. Not a bad start for the official ‘beginning’ of spring. I always laugh as that, because somehow hidden in it is the idea that ‘fishing has finally begun’…which is funny because we’ve already had 2.5 good months of fishing and those who haven’t taken part in it have missed out. Conditions were calm, zero wind, high in mid to upper 60s, no humidity, it was a good respite from the cold of the past week….and that will return mid week this week. We fished one of our nearby front range/front slope foothills DH waters…… a DH water that is a Yadkin R trib…. and did pretty well. First spot we stopped yielded two fine rainbows, and the second spot another, but things really picked up as we moved downstream to a section with some deeper runs and holes….places where the fish are moving into in numbers because of low flows….but it was good…really good. 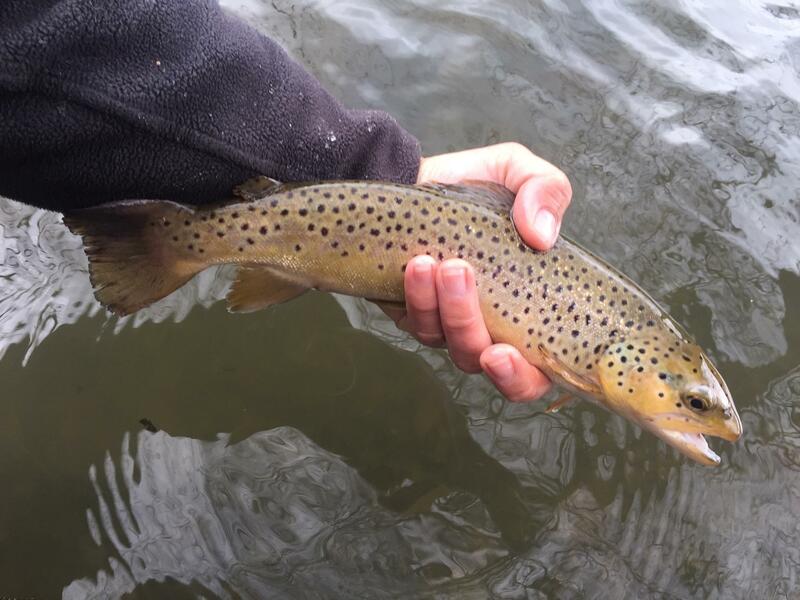 We hit several spots where we would get 4, 5, or 6 fish, a mix of rainbows and brookies, and we did well on nymph rigs…..smaller flies and sucker spawns (river was full of spawning suckers) worked great, normal stuff for time or year and lower water levels. If you don’t have some sucker spawn patterns or yellow orange y2ks in the box you are missing out. We fished them teamed up with a small nymph and killed em. We fished probably a mile and a half area and I’d say put well over 40 fish in the net….between 40 and 50 would be my guess. We fished til about 430pm and called it a day, as Stephen needed to get back. It was sunny most of the day, and only clouded over toward the end, which made the fishing even better than the good it always was. Water temps where we were hit 50F which means bugs…..lots of bugs hatching as long as it stays in that 50 to 60F range. Warm temps continue on Tues, but a front approaching Tues PM will spread showers and thunderstorms over the mtns so a weather change is coming. Have a 2.5 day trip on the calendar that begins today, as I will be meeting my three clients Ted Linczak, Summerville, SC, and Peter Valenti, New York, NY, and Lloyd Allen, Pinehurst, NC, and we’ll be fishing several Watauga, Ashe, and Alleghany County waters. Some showers and thunderstorms plowing over the mtns later today and tonight, but that is all ok by me because we desperately need the rain. Many areas south and west are already at near beginning of summer levels. And warm weather hasn’t even really gotten here yet. Lots of bugs coming off, and that will continue as waters warm into the 50F range, for 50F to 60F effectively represents the time that most of our notable hatches come off. Time to stock the box with larger Blue winged olives (16 to 20), March browns, gray foxes, etc…..and one way to get around having a thousand flies is to carry a parachute Adams in sizes 12 to 20. They cover a lot of these and are a general pattern that looks exactly like none of them but a little bit like all of them….which is why they work. Even with the caddis (darker caddis 14 to 18) so prevalent in our waters right now…the fish will still take a parachute Adams as well as anything. The 2.5 day trip through Thursday 3-23-17 we’ll be fishing 4 or 5 waters. I’ll round out the week with a guided trip on Friday 3-24-17 with Seth Thompson, Mebane, NC, and we’ll be fishing an NC water. Should be a great week, kind of hard to go wrong in the spring around here…..
Nice End to a Great Week….. Sat. Mar. 18, 2017 ….A good week it was, and we had some great fishing despite some incredibly up and down weather…but its March, and that’s typical late winter/early spring transition weather here. Did a few incredibly cold and snowy days early in the week, then a few really cold ones with no snow, and then a day of near 70F. If you want to fish 4 seasons in 2 days come to Appalachia….real normal stuff here though. On Friday I did a 2 angler guided trip, Steven Wall, Greensboro, NC, NC Mtns, ;and Steven and his friend Derek met me very early near Mt Mitchell as they were driving up from Barnardsville, NC/Mills River and they met me for a day of fishing, we fished two waters, decided since they fished the Mills area (water very low there) on their own we would fish some larger water and we met just off I-40. It was very cold, like 20sF, and it stayed cold all day long, with frequent periods of cracking ice out of the guides as where we started fishing in Mitchell County the cold air just seems to sink and settle in the valley along the river….and it did just that. It remained cold til we finished fishing the first place at almost 1:30, but it was great, we put a lot of fish in the net and did our damage on double nymph rigs, a little bit of everything, one of my Cadillac caddis emergers smoked ’em again, I believe because the fish have fed on them heavily the past few weeks they are still in short term memory. But we did very well, landing probably north of 60 fish including some fine rainbows and several citation brook trout….a few of the brookies were real studs… We fished the first place til about 1:30, took a short lunch break streamside, then headed off to our afternoon place in McDowell Co, a section of the Catawba River….fishing was a little slower than where we first fished, ironically, as it was 20F warmer here and a lot of bugs coming off. But we still landed probably 25 to 30 fish to finish the day, landing one here and one there, and hitting a few spots where we caught a lot of fish in one spot. The caddis emergers still did their trick, as did a rubberleg Hares Ear Variant that I love using in the spring….they ate them up. Great day, Steven and Derek were great to spend it with, we landed between 80 and 90 fish roughly, thats a great day anywhere..,,and most of it in 34 to 35F water none the less. On Saturday I did a Fly Fishing 101 lesson /1/2 day guided trip, Jennifer Johnson Group, Dallas, TX, NC Mtns, Jen, and her friends Nina, Chelsea, and Kelly were staying at the Riverhouse on the Mitchell and we were doing a Fly fishing 101 lesson and short trip, which a do quite a bit of for Laina and Doc the owners of Mitchell Riverhouse. The house /property was featured in the the Nicholas Sparks movie The Longest ride…read more. I met everyone bright and early there and we began with a Fly fishing 101 intro, casting, line management, hooking, playing, landing fish, etc., then reading water, rigging, and knot tying. Water levels were pretty low, as they are in a lot of places right now in the foothills waters, and a lot of trout waters central and Southwest NC. Suprisingly, we got some heavy rain overnight and I was kind of nervous about the conditions I’d be arriving to and we’d be faced with but it was fine. In fact, other than settling the normal dust on the road to the house, you could hardly tell it had rained at all. The water was low and clear, which hurts certain things or methods of fishing but helps others. I knew we’d be fine and we were, the girls landed quite a few fish and even one huge brook trout, a citation fish for sure, plus a lot of other rainbows and brookies. We surpassed double digits and ended with about a dozen fish caught. So, no experience fly fishing plus a little instruction and about 3.5 hours equalled at least a dozen fish in the net. Not a bad half day at all. We had great weather, such a contrast to Friday’s shivering temps, it was sunny and 67F and no wind. A reward for the bitter cold of all week. Have a busy week coming up with a 3-20 trip guiding Dr Stephen Hardy in the NC Mtns. Will be doing a Tuesday night 3-21 through Thursday 3-23 2 day group trip with Peter Valenti, New York City, NY, Lloyd Allen, Pinehurst, NC, and Ted Linczak, Summerville, SC. I’ll finish up a week on Friday 3/24 with a one angler trip guiding Seth Thompson. Should be a great week, looks like somewhat of a mild up but like me I wouldn’t hold your breath. It can change in a minute. If you venture out I’d have some lighter tippet (5x fluoro), longer leaders (9 feet instead of 7.5) and downsize your shot and strike indicators if you aren’t catching fish. Unless you are in the NW corner of NC chances are you will encounter low water. Its low everywhere, and we need rain. Also put on your stealth game. Chances are you’ll see some rising fish. If you do, you can figure out what it might be by visiting our This Months Fly Box page . You can even download a printable copy of the March hatch chart here . Caddis have been thick lately in a lot of places. I will refrain from any comments about our favorite team and the NCAA tourney. But those who know me well know where my passion and convictions lie….. Absolutely Bitter Conditions…..But We did WELL……..
Wed. Mar 15, 2017 ….Monday and Tuesday marked a very significant weather change, one of the most drastic I’ve been out it. Winter Storm on Monday night and into late Tuesday, I did an ESCATAWBA Farms/Dunlap Creek Trip, and had one Client Brian Fitzgerald , Thomasville, NC, join me for the day. This day would be one that was right in the thick of a winter storm. We arrived creekside to windy, Cold (capital C) and snowy conditions. Just about the coldest day of the year /2017 for me, and we’ve been out in some pretty cold conditions. It was raw, but Brian and I suited up and went to business. First area yielded a few fish, one 19″ rainbow, and a couple of smaller ones. Water level had dropped a bit, and the water was ultra clear, making a switch to finer leaders and smaller flies necessary. The next spot we fished we nailed several nice rainbows up to 20/22″, and it became clear that small flies were going to fool a lot of the fish with clearer conditions. Several 20/20s would occur, fish of 20″ on a fly size 20 or smaller. It never stopped snowing on us nor did the wind stop blowing, making for a pretty chilly experience. We continued down that road not traveled by many, and for doing so continued to reap the rewards of some nice fish. We got to the upper part of the river and found some fish that were midging, so I downsized our usual zebra midges to some of my ‘Skinnys’ , a thread midge with a minimum of bulk and material. It was the ticket, we nailed several really nice fish and all of them on that fly. We took a quick lunch break, warmed up a little, then headed to fish the middle part of the river. First spot we fished yielded several good fish, including the lone brown of the day, an 18″ fish that was gorgeous. The next fish was a 20″ plus rainbow, with a red stripe….red, not pink, red…..that would be the envy of any NC State fan. It was a beaut. We landed several others from that run, and then moved downriver to one more spot. We caught another two fish there, made a few casts at one more pool, then decided to call it a day. The temps were plummeting and we walked back so we could get back on the road before dark set in. Very chilly day, some very nice fish, and Brian was great to experience it with…not to mention being tough as steel for fishing in these conditions. Below is a video of some of what the day was like…. Have a day or two to do some much needed web editing, catch up on an always present mountain of messages, texts, and emails, and replace some holes in the fly box, boxes that have taken a real hit with all the great fishing we’ve been taking part in. Looks like its cold for the next several days. I have two guided trips coming up, one on Friday with Steven Wall, Brevard, NC, and a Saturday trip with Jennifer Johnson and her group of 4 from Dallas, TX. Should be a great end to another good week. It will end on a warmer note though. Mon. Mar. 13, 2017…. Busy week last week, finally a day off to recover. Last week was great, ended the week on Saturday with a guided trip with Greg Adzima, High Point, NC, and his son Alexander Adzima, Boone,NC. We fished in NW mtns and I we knew we were in for a very cold day as things have been changing in the weather for days. Today was no doubt going to be a test of fishing mojo as well as fortitude….the weather was bitterly cold, windy, pretty raw to be outside in. But I was confident in that if we fished deep and patiently and got good presentations we’d do well enough to call it a good day. It was in the mid 20sF when we stepped out of a warm truck and started putting our gear on. The first spot we fished yielded a handful of strikes and one large fish that got off just after hookset. The second run and hole we fished produced…..big time. Put about 10 to 12 fish in the net and several others that came off or unbuttoned. Several good rainbows and one stud brookie. We fished deep with double rigs, one rig a sucker spawn or mop fly in tandem with a small egg pattern or small nymph. Our other rig was an early brown stone or black stone teamed up with a caddis emerger, which has worked like a charm all week with all the caddis coming off. And the fish with their short term memory no doubt remembered the caddis because the emerger ate them alive. We caught about 20 nice fish at the next stop, then headed up to another two runs where we did the same again. Several places it was fish on five or six consecutive presentations. In other words, Greg and Alexander killed em. Alexander landed a rainbow that was in the 22 to 23″ range and close to 5/6 lbs. Greg landed several more rainbows, and about 130pm we took a break for lunch streamside. This week is starting off with a bang. Low pressure deepening off the coast is going to turn into a snow producing monster, the Northeast will get hammered while we’ll just be dealt a glancing blow. But the glancing blow will be enough for it to fully feel like winter again. Looks like a mix of 1 to 3″ of snow and sleet for the lower elevations and 3 to 6″ for higher elevations and up to a foot for areas along the NC/TN border and NW NC /SW VA border counties. I have a guide trip planned for tomorrow in Covington, VA, and we could see the brunt of it there. Right now, the trip is a go but that could change I guess upon one last check of the conditions late tonight. I am just thinking of all the great caddis hatches we fished this week, and how this snowstorm is the perfect thing to squelch all that out …..for now. Be safe if you head out/up….looks to be a dicey one if you are headed to the high country. Fri. Mar 10, 2017 Winter came back late last night with a vengeance. I did a guided trip with Wesley and Susan Gormus, Lynchburg, VA, on Dunlap Cr, and I met Wes and Susan early /mid morning and we suited up…it had been raining and the river was running about 115cfs which was perfect….it was cloudy to start with drizzle and with an incoming powerful cold front we got high winds and snow the rest of the day…on and off. Hard to believe we were fishing yesterday in 65F weather and sunny skies tossing dries and today in the 20s/30sF and shivering. The fish didn’t mind here though, we started with nymph rigs and did very well. It was Susan’s first day fly fishing, and going from never have fly fished to catching a fish took every bit of a minute and a half. Then a second fish, then a third fish, then a fourth. I think she landed 4 or 5 nice fish in the first 10 minutes. All rainbows, all quality fish in the 16 to 20″ range. We used a lot of junk patterns and rubberleg nymphs, did well on them too. Wes was below us hooking up repeatedly as well. There were several times we had doubles. We fished about a quarter mile of river, hitting my favorite spots, and catching a good many fish in each. Had one fish on that looked to be in the 28 to 30″ range but it came off within feet of the net….Susan had caught it. We fished through some really high winds, like gusts to 30 and 40mph, which made it hard to even get the line on the water….but as I told Susan and Wes “the wind is your friend”. What I mean/meant by that is that too many people quit when the wind gets up, and fail to understand that the wind puts a chop on the surface , and ripples the surface, and if you are nymphing with an indicator the wind chop simply ‘jigs’ or ‘twitches’ your fly for you…..micro twitches I call them…and it drives the fish nuts. So while others are sitting at home in the easy chair, or in the truck waiting for the wind to die down, or lamenting it…..we are catching fish. I welcome wind because I’ve learned to use it against the fish. We took a short lunch break around 2pm , then headed for another stretch of river and it was even better than our morning fishing. Several fish over 20″, and several double hook ups ….it was awesome. And at times it was so windy and rough you’d have though even making a cast was impossible. Just get it on the water, keep the rod low and line on the water, and concentrate on getting a drift…..with that we were in fish the whole time. We finally quit about 530pm and it was bitterly cold. Wind never died down, and the temps were plummeting. But an awesome day it was, and we landed north of 60 fish….and Susan probably landed 25 or so. I’d say that’s pretty good for a first day of fly fishing…not to mention they were all 16 to 22″ fish. All rainbows. I will be finishing up a week in which we have fished all over. Its been a good week for sure, we’ve put a LOT of fish in the net this week and in all types of conditions. I will be guiding two regular clients tomorrow/Saturday and I expect we’ll do pretty well. The weather is cold for sure, and will be even colder in the morning but we should be fine. Looks like a late winter snowstorm is riding in for the weekend. How much? Some, maybe 1 to 4 inches. All of that is still up in the air. But one thing is for certain, temps are perfect for it. Fri. Mar. 10, 2017 Great day yesterday guiding Dr Sims Riggan, and his son Cole ,Lexington, NC, NC Mtns, we opted on day 2 of our two day trip to head back to the NC side and get in on some caddis action…which we did. Met Sims and Cole bright and early and we rode over the mtn to the Watauga Gorge, and did well there as the caddis hatch is in full swing there…..we rigged up and had rising fish late morning. Sims smoked em pretty good on dries, these are #14 to 18 Dun caddis and loads of them…and my favorite fly is a parachute Adams for this. I gave Sims one and he tied it on and it was game on. I think he caught every riser he covered with it, landing well over a dozen fish on dries. Cole was immediately downstream and I was working with him and he landed a half dozen nice rainbows and one nice redhorse sucker. We worked our way downriver and fished several more runs, catching one here , one there. Cole fished a spot that yielded 6 or 7 rainbows. We took a lunch break about 145pm and decided to head on over to the upper New…did well there as the same caddis hatch was coming off when we got there, only much heavier. Sims nailed about 10 fish nymphing and Cole caught 3 or 4 doing the same, but we switched to dries and ended up catching probably 20 more fish on dries…it was awesome. At times so many bugs it looked like a snowstorm. Happens on these waters every spring, usually mid March. It was great day, landed in the range of 40 to 50 or so. Headed out to guide a couple from Lynchburg, Wes and Susan Gormus. Clouds, rain, windy is the weather scoop. Hope it’s a great day anyway, we are sure giving it a good shot. Wed. Mar. 8, 2017 The mountains got a nice shot of rain yesterday, some areas more than others, and most of it came overnight. I did a guided float trip with Dr Sims Riggan and his son Cole, Lexington, NC. We did a TN South Holston float, we did the long float today putting in at the dam and floating to Rockhold, about 11 miles. Cole had first fish in the boat after we were barely underway, then quickly scored another right away. No risers on the upper river but we caught some nice fish on nymph rigs, both rainbows and browns. The river was high even during full generation from all the rain, and it was off color as well in some stretches. A few more nice days til we are supposed to get a late winter snowstorm on Saturday night/Sunday. I’ll be doing another TN trip tomorrow guiding Sims and Cole Riggan tomorrow, we’ll do a half day float followed by a half day wade trip in NC. Then I’ll be doing a private water trip on Friday guiding Wesley Gormus, Lynchburg, VA, and then round out the week guiding a Saturday trip with Greg and Alexander Adzima. Busy week indeed…. Great Start to Our Week…..
, Tues Mar. 7, 2017 , Started the week off strong with a trip with one of my clients Ted Linczak, Summerville, SC, NC Mtns, Ted , one of my regular clients joined me for the day along with his brother in law Connor, it was Connor’s second time fly fishing. We got a late morning start, it was mild after a chilly night, and it was breezy/drizzly and we got partly to mostly cloudy conditions to start. Fishing was good from the start, and quickly it was apparent this would be one of those days where the fishing report would sound like a lie. We fished double nymph rigs and did really well, catching a mix of brookies, browns and rainbows, several stud brook trout, one really nice brown landed by Ted, it was awesome. I think we landed between 130 and 150 fish total, and Connor caught probably 60 to 70 himself. Water was still up and pretty clear with a slight tinge of color, ideal for nymphing. We did best on junk flies and some rubberleg nymphs, a rubberleg hares ear was dynamite as was a sucker spawn fly. Spawn flies typically work great in spring, and they did today. The rain held off til almost 4pm, and we fished the two hours in the rain. Great day though, going to be a great month. Headed out to do a 3/8 float trip with Dr. Sims Riggan, Lexington, NC. It will be Sims and his son and looking forward to a nice float on the South Holston.